Are you sure you want just one? Great pets for great families. 3. The buyer will return the pup to breeder if buyer is unable or unwilling to care for the pup. Buyer will never surrender the pup to a dog rescue, animal shelter, or a friend/family member without the permission of the breeder. 4. Breeder agrees the pup has had proper care to date of this sales contract and has been examined by a licensed vet. Pup has received all age appropriate vaccines and regular de-worming as recommended by the vet. A record of all vaccines/deworming will be provided at time of this sales contract. 5. If, during the time of the initial 72-hour vet exam, pup is found to be at serious risk of euthanasia or death due to a congenital defect, buyer shall notify the breeder and provide a written statement from a licensed vet describing the pup's condition and buyer shall return the pup and all required paperwork to breeder within 3 days of the exam. Breeder will replace the pup or refund the price paid for the pup by the buyer (excluding shipping fees and vet expenses). This does not include worms, fleas, mites, coccidiosis, giardia, or any other parasites as these are common in pups and are typically easily treated. 6. Breeder guarantees pup against any congenital defect resulting in death or necessary euthanasia until pup is one year old. This is extended to 2 years if the buyer uses NuVet Wafers using code______________ to make purchases and keeps receipts as proof. 7. Due to the fact that joint problems are not strictly influenced by genetics, breeder does not offer any guarantee for hip, elbow, or other joint abnormalities. We are Cold Spring Mountain Retrievers have done everything possible to assure that we are raising genetically sound puppies (proper nutrition, joint supplements, and comprehensive health screenings). Unfortunately, once the puppy leaves our possession, we have no control over the environmental factors that may also affect joint integrity These include are but are not limited to improper exercise, poor nutrition, and unhealthy weight maintenance. 8. Breeder offers a 1-year guarantee against heart murmur in the event the pup is found to have a moderate to severe heart murmur (grade 5/6 or 6/6) Diagnosis must be confirmed by a licensed vet and a canine cardiologist. This also is extended to 2 years by proof of use of NuVet Wafers. 9. No monetary refunds will be provided (excluding the initial 72-hour period). 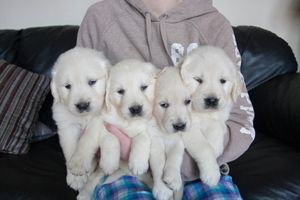 In the event the buyer has to return the pup to the breeder as a result of a condition covered in this guarantee, breeder will replace the pup with a pup from a current or future litter. Replacement pup will be of the same value as purchase price of the original pup (excluding vet expenses and shipping fees). 11. In case of sudden demise of the pup, breeder must receive a written notice of pup's death from buyer’s vet along with a necropsy report indicating cause of death.